The fire engines never returned in their garages, and the firemen never returned to their homes. These fire engines are some of the most radioactive objects in all of Chernobyl. The firemen were the first on the scene, and they thought it was an ordinary fire. No one told them, what they were really dealing with. The Liquidators are those people who were recruited or forced to assist in the cleanup or the "liquidation" of the consequences of the accident. As a totalitarian government the Soviet Union forced many young soldiers to assist in the cleanup of the Chernobyl accident, apparently without sufficient protective clothing and insufficient explanation of the danger involved. Over 650,000 liquidators helped in the cleanup of the Chernobyl disaster in the first year. Many of those who worked as liquidators became ill and according to some estimates about 8,000 to 10,000 have died from the radioactive dose they received at the Chornobyl Power Plant. This group apparently includes those who built the containment building over the destroyed reactor No. 4 which is called the SARCOPHAGUS. 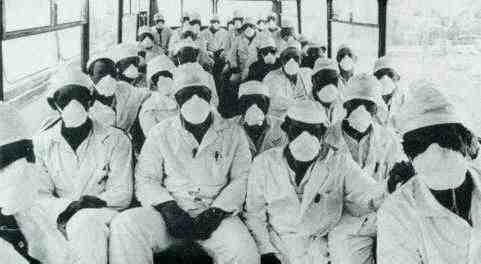 picture: Cleanup workers (Liquidators) going to the Chornobyl Plant. Photo by Lu Taskey. This hellish inferno became a sort of paradise for wild animals - at least on the surface. They thrive with no humans to prey upon them, but nobody fully understands how the nuclear poisons have altered their genetic makeup, the extent of their migration or their interactions with the adjacent "safe" areas. Grotesque mutations have been reported, but zoologists deny that. Populations of wolfs and wild boars grow rapidly. 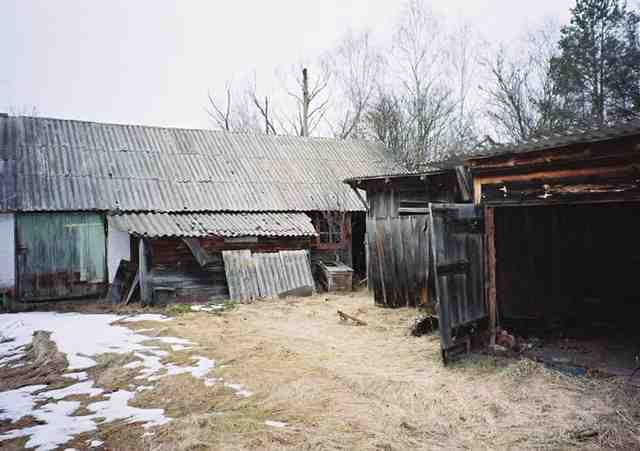 They occupying the abandoned houses and sheds. They are curiously unagressive here. Maybe that has something to do with the food supply which plentiful for all species except man, but contaminated. It's not unusual to see a wolf, a fox, a wild boar or a wild deer casually crossing the road.